Skateboarding News: As the story goes, Steve Caballero wasn’t content with the ankle on his Vans Caballero High. Armed with a pair of scissors and some duct tape, Cab took the ankle height down a peg, creating not only a more skate-friendly shoe, but a classic sneaker in the process. 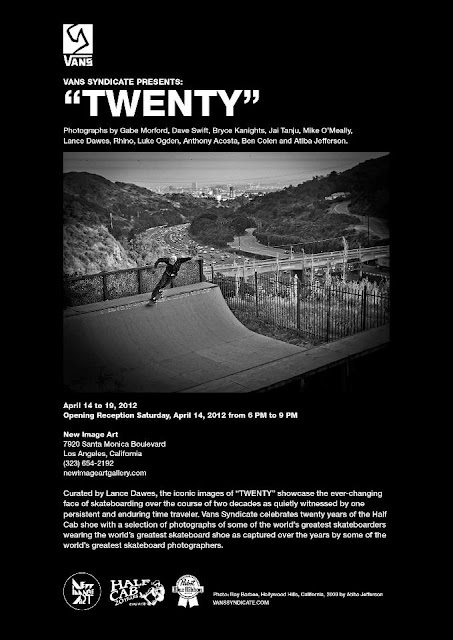 The Half Cab was born almost 20 years ago and to commemorate the occasion Vans is releasing a selection of pix of some of the world's greatest skateboarders wearing the world’s greatest shoes as captured over the years by some of the world’s best photographers. And they will show the iconic images during "Twenty" at the art Gallery located 7920 Santa Monica Boulevard L.A.